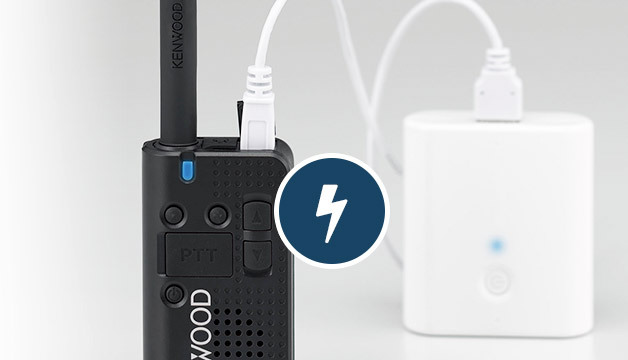 At 3.9oz, the PKT-23P is the smallest and lightest 2-way radio from Kenwood. With 15 hours of battery life, this radio is simple and easy to use; yet durable with IP54 / MIL-STD 810 construction. Accessories included: 1) Battery, 2) Rapid Charger, 3) Belt Clip. Light Weight, Simple to use. Fitting in the palm of your hand, the PKT-23P is easy to take anywhere your staff needs to go. At only 3.9oz, it can fit comfortably in an apron pocket or attached with the included belt clip. The front panel button layout makes the PKT-23P very easy to operate. Instantly communicate with your entire workforce. Quickly and effectively communicate to your team with one-to-many communications. The PKT-23P also boasts 16 channel capacity so you can assign channels to specific team members. Rest assured that with the extended coverage of the PKT-23P radio your Push-To-Talk (PTT) communications will be crystal clear with up to 8KM’s coverage. With the built-in (replaceable) battery your staff will get 15 hours of continuous use – more than enough to tackle each and every shift. Connect the KHS-33 or KHS-34 headphones for better use in private communications or in noisy environments. The PKT-23P is equipped with a micro USB to utilise your smartphone charger in remote areas where the included charger is not ideal or available. Simple, hands-free communications for clearer audio performance in noisy environments, or to ensure a private conversations between staff are kept private. Ensure a secure and comfortable fit with the included belt clip. The radio can also fit comfortably in a pocket or around your neck (with lanyard). Battery and fast charger included to keep your radios operational for each and every shift. Optional gang charger available.